BYU started the year looking bad, going 8-7 non-conference, but are in 2nd place by a half game, at 6-3. I expect Yoeli Childs to dominate, like he did in Provo when he got 28. TJ Haws is their other scoring threat and best outside shooter. DD's favorite Nick Emery is coming off a big game against LMU. The Cougars three losses are at USF, at SMC, and GU. They have a great chance to hold second place and get the double bye in Vegas if they can beat USF in Provo (they already beat SMC there), so I don't expect them to take any other games lightly. And of course there will be a good turnout of BYU fans in Chiles. One team's "bad" is another team's "if only..."
The wiseguys have BYU favored by 12.5, foreseeing a 79-66 game. 99% of bettors are taking the under. up7587 wrote: The wiseguys have BYU favored by 12.5, foreseeing a 79-66 game. 99% of bettors are taking the under. Hard to blame them taking the under. I would take BYU even at 12.5. What I'm really curious about is who listed tickets for tonight's game at $70+ on Stubhub. The over-under I’m interested in is if Haws will score his age. This is embarrassing. Worst team I ever remember BYU having. 56-27?! Holy ****. I expect the post game highlights will be mostly the halftime unicyclists. Pilots committed 20 turnovers and made 15 field goals in this game. With tonight's six-point performance, Josh McSwiggan raised his conference scoring average to 5.9 points per game. McSwiggan is shooting .264 from the field in conference play. That puts Clark to shame, who's at .208, but can't keep up with the blistering shooting of Franklin Porter at .319. JoJo Walker is embarrassing all three of those guys at .350. Tryon is doing better in conference play, shooting .426. However, that average is dragged down by his continued insistence on shooting three-pointers, which he is not good at (.250). He's shooting .529 on two-pointers. The fact that the coaching staff still has him playing mostly out on the perimeter where he jacks up threes and commits turnovers while dribbling is unfathomable. He looks good in close to the hoop and shooting mid-range jumpers. And he can get rebounds when he's inside the three point line, which might be nice since he's 7' tall. But the top shooting star on the team during conference play is Diabate at .600. He has looked good the last few of games driving the lane out of the high post. I'd like to hear the coaches' explanation for why the guy with the highest shooting percentage is #9 in minutes played during conference games, at 14.4 minutes/game. During conference play, Diabate is also leading the team in rebounds/minute played. So why are 8 guys playing more minutes? Based on this, Diabate and Malcolm should be getting more playing time, and McSwiggan and Franklin should be getting less. I see Josh Phillips reappeared sometime after I turned the game off. First time in the last 16 games he’d gotten in. NoPoNeighbor wrote: Based on this, Diabate and Malcolm should be getting more playing time, and McSwiggan and Franklin should be getting less. I think it might be a little dangerous to make too many conclusions based on points per minute, given that would reward players for chucking up a ton of shots and scoring points no matter how inefficient they might be (not saying any Pilots fall into this category). • As you point out, Diabate is the team leader this year in FG% - not only for conference games, but for the whole year. And not only FG%, but also effective FG% if you're into that metric. His rating is pulled down by a high turnover rate (22%) and a low FT% (38.1). • McSwiggan's had a rough go of it no matter what way you look at it. I feel bad for him. • I remember Tryon being billed as a 50% three-point shooter coming out of JUCO. Given his struggles this year I went back and looked up his stats at East Los Angeles College. He was 50% all right, but was only 19-38 (he only attempted 8 threes in 10 conference games last year). 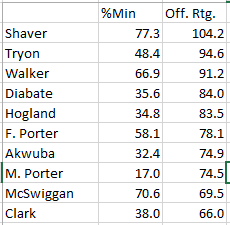 I'm going to do some more digging and see if I can isolate his back-to-the-basket stats if I can get some time today. EDIT: Also, when it comes to playing time obviously what happens on the defensive end of the floor is as important or more important than any offensive numbers. I'll need to rely on people with actual basketball knowledge to chime in on this aspect! NoPoNeighbor wrote: Tryon is doing better in conference play, shooting .426. However, that average is dragged down by his continued insistence on shooting three-pointers, which he is not good at (.250). He's shooting .529 on two-pointers. The fact that the coaching staff still has him playing mostly out on the perimeter where he jacks up threes and commits turnovers while dribbling is unfathomable. He looks good in close to the hoop and shooting mid-range jumpers. And he can get rebounds when he's inside the three point line, which might be nice since he's 7' tall. Dean Murdoch wrote: I'm going to do some more digging and see if I can isolate his back-to-the-basket stats if I can get some time today. Our 7-footer Jacob Tryon has posted up a total of five times this year and is 2-for-5 in those situations. I think one of the made shots would have been on the Pilots' first possession last night when he made that nice turnaround from well out. No idea when the other one would have been. Geezaldinho wrote: I expect the post game highlights will be mostly the halftime unicyclists. At the pre-game coach's talk, Coach Geving said the focus was to avoid turnovers, since BYU was very good at transition baskets. That didn't work out so good. Several times a big guy got the ball stolen either when he tried to dribble, or when he brought the ball down low. McSwiggan was removed from the starting line-up, with Franklin in his place. Not sure if it's due to his poor play, or part of the line-up plan for doubling on Childs. We'll see against LMU. Also, don't know why, but the BYU crowd was way down from previous years. Late start, ESPN2 broadcast, not a tournament team, no Jimmer, whatever, but far fewer Cougar fans in Chiles. Even with Bobby Sharp I'm not sure this team could have pulled off a win. I have 100% lost any faith in Porter as the head coach. Porter saying the team "played hard" and "played together" are incredulous comments after getting destroyed at home by BYU's weakest team since they joined the WCC. Someone needs to tell the UP big men especially Tryon that it is perfectly acceptable for them to post up or dare enter the paint.